Tour Washington DC for 180 minutes and take photos of some of its most popular sights and famous attractions. You will be given a vintage Polaroid instant camera for the duration of the photo tour and your adventure will start with a training on how to use your camera. You will also learn a little bit about the history of instant photography before you start exploring the city. No previous knowledge about Polaroids or photography is required. 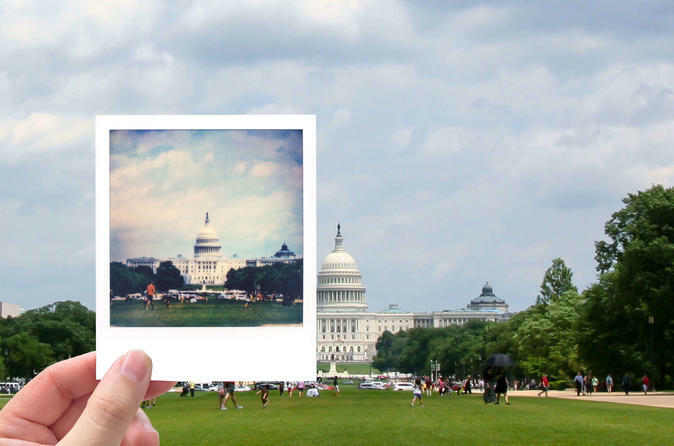 Take home your unique DC photo souvenir that won't let you forget your trip. Your local guide shows you the best photo opportunities and will help you with angles and composition. Your guide will be happy to take pictures of you, your family and friends and to answer all your questions about photography and Washington (Your guide is a local who is happy to answer questions you have about Washington, but please be aware of the fact that our tours are focusing on experiencing the city through the lens of one of our Polaroid cameras and are not classic sightseeing tours. Your tour ends at the Smithsonian Institution Building. There we will review your pictures, answer your questions about what to do in Washington DC, recommend places to eat and give tips on what to see and where to go.